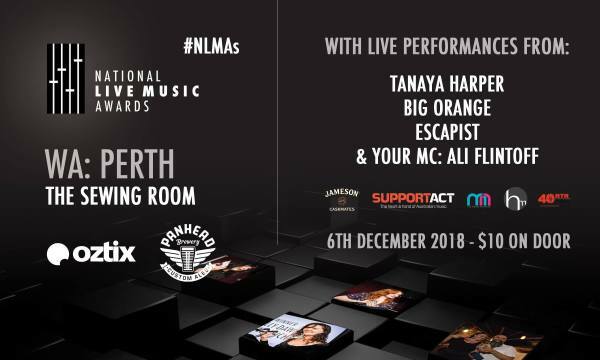 The WA leg of the National Live Music Awards will return to Perth at The Sewing Room! The night will feature 3 live performances as well as no less than 5 award presentations for Best Live Act, Best Live Voice, Best Live Event, Best Live Venue and All Ages Achievement in WA. You can see all the nominees HERE. Plus, there will also be a lucky door prize giveaway courtesy of Audio-Technica Australia! Performances on the night include, Rock Scholars alumni Escapist, Tanaya Harper and Big Orange… plus your MC of the night, the amazing Ali Flintoff from Dream Rimmy and BOAT SHOW! Thursday 6 December from 6pm- 10pm tickets are just $10 on the door with $5 from every ticket going to the amazing charity Support Act.